For cozy nights of camping, why not try Boler camping trailers? These travel trailers are efficient, light-weight, and built to last. One of Canada's most sought-after trailers, the Boler trailer was named after the Bowler hat, which it strongly resembles. As with teardrop camping trailers, the name has to do with the shape of the unit. Who came up with the Boler? The trailer, that is, not the hat. Ray Olecko of Winnipeg, Canada was the inventor. What motivated him to manufacture the first Boler was his fascination with fiberglass. First, he created a fiberglass septic tank and after that, he daydreamed about a light-weight trailer. One night, while camping with his family, Ray came up with a blueprint of a trailer based on his own family's needs. He needed a kitchen and places for all four of his family members-- two children and two adults--to sleep. He drew his idea on a piece of cardboard which he later took to a fiberglass molder and asked the professional to create the trailer. He paid $1,400 for the finished product. To dealers, this seemed high in comparison to the aluminum trailers that sold for only $895. However, when dealers saw how light Ray's Boler was due to the fiberglass material he used, and how easy this camping trailer could be pulled, they felt the price was right. In 1968, 100 of these Bolers were built and the next year production increased to 150. By 1972, 220 trailers were built a year. When Ray sold the Boler Trailer Company to Jimmy Pattison's Neonex in 1973, production was around 10,000 units annually. Bolers ceased to be manufactured shortly after this. Boler travel trailers are relatively small, compact trailers with a kitchen. The kitchen stove is usually a two-ring propane burner. A small table stands in the kitchen surrounded by seats. Counter and cabinet space is adequate. The two sofa-beds have the capacity to sleep four. The Boler is equipped with fresh water holding tanks. A port-a-potty-style toilet is included. 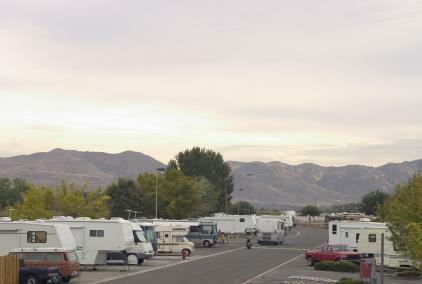 Many of the Bolers have awnings so that you can sit outside beside your trailer and enjoy the shade and scenery. Now that you have learned how nice Bolers are, you may want to know where these vintage trailers can be purchased. Since new ones are no longer being built, you will have to go online and see who has one for sale. Check online RV sales websites as well as eBay under the Towable RVs and Campers heading when you want to find out what is available. A used 13-foot Boler camping trailer can cost anywhere from $3,000 to $7,000 or more. The price depends on how well the upkeep of the trailer has been, and if it has new upholstery or fresh paint. The Bolers that have had the best care are able to command a higher price. Those who own Bolers tend to be proud of their recreational vehicles. There are reunions for the Boler camping trailer enthusiasts, and rallies are even held. Are you a vintage trailer owner? You may want to see when the next reunion or rally is being held. Tin Can Tourists is a site where you can catch a glimpse of those with a love of classic or vintage trailers, including the Boler. This club goes back to as early as the 1930s, but was revised in 1998 at Camp Dearborn in Milford, Michigan. Twenty-one trailers attended this renewal gathering. Since that time, the group has grown and now holds its annual meetings in Michigan as well as in Florida. The Tin Can Tourists have even gone international with representatives from Japan, England, and France. One of the main goals of the club is to promote and preserve vintage trailers. Membership is open to all. If you want a light-weight camper that can be easily transported by a small car, and a trailer that can fit into a regular-sized parking space, then the Boler is for you. So get ready to head to your favorite campsite and enjoy a relaxing time. Are you interested in finding out additional information about camping trailers? These articles are filled with interesting information.